phpBB • Firefox Quantum Addon for PhpBB codes? I have been using BBCodeExtra, and I have a few dozen custom tags, both BBCode and HTML, but it does not work with FF 57+ (Quantum), so I am looking for a replacement. Anyone using something for newer versions of Mozilla that they like? I wasn't quite sure where to have it. The correct abbreviation for Firefox is Fx. Consider using an internet browser similar to Firefox but still supporting the old add-on interface, such as Waterfox. that is interesting about the correct abbrevitaion. I have been using mozilla products and only mozilla since 1995 ( netscape came on two or three floppy disks back then ). this is the first I have ever seen or heard of firefox being abreviated as "fx". I'm with Lumpy on this. I guess maybe that could be another reason why I never use wikipedia. I don't understand why anyone would depend on anything found on wikipedia as being accurate. I am sure that many of the entries ( maybe even most ) are accurate and true. however, considering the way it works, there is no way to know for sure without doing more research. that being the case, do the research yourself to get the information you are looking for. The problem with acronyms is there’s no control. While working in the semiconductor industry I found their use of acronyms bewildering. There were something like 25 pages of industry acronyms many duplicated in other walks of life. That is taking effing to the next level. Good Wikipedia articles come with sources, and the Fx abbreviation (acronym is something different) is linked to an official source. When I grew up FF always meant Final Fantasy, and sometimes "fast forward". I could not find a replacement. I now use Chrome to post on phpbb. 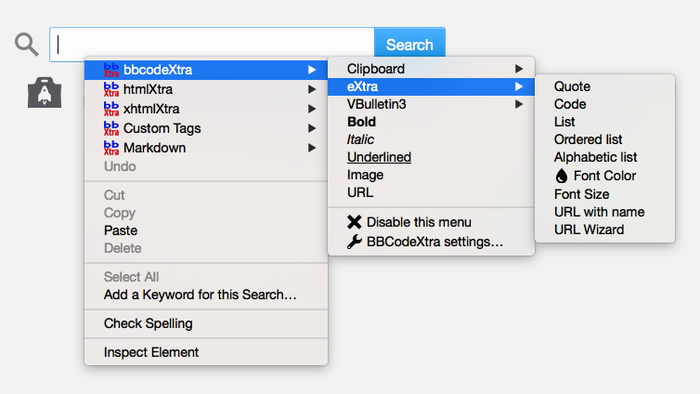 Chrome has a BBCode extension called bbCodeInsert, which is not as good but is better than nothing. If anyone wants a copy, PM me. I have managed to Port bbCodeInsert to Firefox ...If anyone wants a copy, PM me. anyone willing to port it over to WE. So that gives carte blanche to anyone to get this extension working again! Yes, but the bbCodeInsert author has gone to ground, which is why I cannot submit it to AMO. Point taken. Thanks for the xpi for FF for bbCodeInsert, sent to me via email and added to FF without a problem. It works extremely well, and is shaping up as a worthy replacement for BBCodeXtra! It looks like I am going to have to learn how to write XPIs for Mozilla Quantum, and then rewrite this using it as an advisory structure to put it up on the FF addons page because of license issues.